Town of Simeiz is part of the City of Yalta, in Crimea Autonomous Republic, Ukraine. It has a population of 3,501 (in 2001). The flag was adopted by Town Council in 07.07.2006. Authors are Maskevich O.I., Konovalov V.I. and Doroshko V.N. The flag is shown on the pages of Sevastopol's Heradic Society "Gerakleya". "It was confirmed in July, 7th, 2007. Rectangular panel with ratio 2:3 consists from red, dark blue, wavy white, blue, white and blue strips in the ratio 33:48:2:2:2:13. 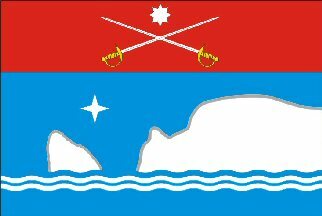 In the top strip are two white crossed swords by edges upwards, above which is white eight-final star. In the second strip are white stylized mountain Kishka and rock Diva, above which is white four-beam star." "The shield enframed by or cartouche and crowned by argent crown with or sun. The supporters are or griffins. On the gules motto tape is or name of settlement." "It was confirmed in July, 7th, 2007. Per fess. Gules; two argent swords in saltire by an edge upwards, accompanied in chief by argent eight-beam star. Azure; above two argent abaised wavy barrulets are argent mountain Kishka ("Cat") and rock Diva, accompanied in chief by argent four-beam star. The swords are arms of Mal'tsov's family, who did the settlement one of the best resorts of Crimea. The mountain and rock are symbol of Symeiz. The star above them reminds about observatory, based in 1900 on a mountain Kishka by Mykola Mal'tsov. In 1959 there was received the image of the return party of the Moon. The gules colour symbolizes courage, bravery, azure means beauty and greatness, dark blue sea and light-blue sky."